Imaginary worlds can play such a big role in our lives. So many people have been moved by Middle Earth, many of us know which Hogwarts House we should be in. As adults we can invest a surprising amount of passion and energy in things that do not, in any tangible sense, exist. And those investments can have huge, real world consequences. How many people get into physics because they secretly hope to invent warp drive, or the light sabre? We have to imagine something before we can make it real. When a speculative book comes into the world, we get to interact with each other’s imaginary places. One of the great joys for me, in helping Tom create Hopeless Maine, has been watching people get involved and make parts of the story their own. It’s a roomy reality, it’s always been open to collaborators, and back when we were running The Hopeless Vendetta regularly – the island’s newspaper, people really did get involved in the stories. (Do, do read the comments). 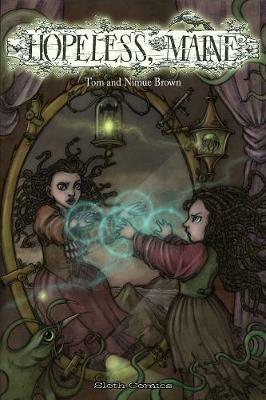 Hopeless Maine is back out – volumes one and two in a single edition, plus The Blind Fisherman (previously on the webcomic but not previously on paper) and a new small story about Reverend Davies. This entry was posted on Wednesday, December 14th, 2016 at 11:30 am	and tagged with books, fiction, othre worlds, speculative and posted in Bardic. You can follow any responses to this entry through the RSS 2.0 feed. Unfortunately since my cataract operation, so far, it appears that my book reading days are permanently over. Two weeks and four eye exams, have still shown my eyesight is worse, not better. However another exam on Friday.